Why not? After all the victims are Jews not Arabs. After all to the UN, the Lame Stream Media, the State Department, only Arabs can be victims. Jews are never to be considered victims no matter how many rockets are fired, how many babies are murdered. Palestinian terrorists in Gaza continued their rocket assault on Israel Wednesday afternoon after a three-hour pause in the attacks, which have seen dozens of missiles target the south in the past two days. More than 80 rockets and shells had been fired into Israel Wednesday by late afternoon. 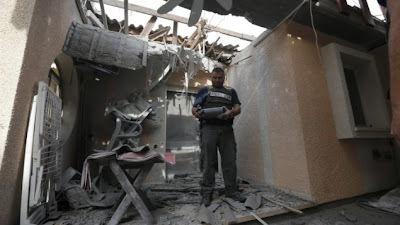 A salvo of eight rockets fell on Hof Ashkelon just after midday, shattering the quiet that had descended for a few hours after a series of rocket attacks in the morning. Another two projectiles were fired at the Hevel Eshkol area. In late afternoon, another missile strike was recorded. There were no reports of injury or damage in the latest attacks. Three foreign workers were injured, two of them seriously, in Wednesday morning attacks when a rocket hit the chicken coop they were working in, and several houses were damaged by other missiles. At least two other people were reported lightly injured in the strikes. Some of those hurt in the attacks were flown by helicopter to Soroka Medical Center in Beersheba. School was cancelled in areas close to Gaza on Wednesday, and residents were told to remain within 15 seconds of “secure rooms” in case of further attacks. He also promised to fortify every building in communities 4.5 to 7 kilometers from the Strip, where until now only educational facilities had been protected. On Wednesday morning, Iron Dome intercepted seven Grads fired at Ashkelon. In the afternoon the system stopped another missile fired at the city. France sharply condemned the rocket fire on Israel, urging restraint from both sides. Since Tuesday afternoon Palestinian terror groups in the Hamas-controlled Gaza Strip have fired dozens of rockets and mortar shells at southern Israel. The incoming missiles were a mix of Gaza-produced Kassam missiles and military-grade Grad rockets that have a longer range and larger warhead. The IDF has responded to the barrages by targeting terror cells and Hamas installations in the Gaza Strip. Three Palestinians were killed in overnight airstrikes. IDF Chief of Staff Lt. Gen. Benny Gantz called a meeting Tuesday to assess the situation and toured some of the sites that were hit in attacks. Barak said he could not rule out a ground invasion if fire continued. “If we need a ground operation there will be a ground operation. We will do whatever necessary to stop this wave” of violence, he told Army Radio on Wednesday. “It’s important for the government to think before it decides. This move will bring escalation and not peace — there is no way to reconcile with the terror from Gaza. We are considering everything we need and examining everything. If there will be no choice and the fire continues, they will be struck hard, nothing is impossible,” he said. Liberman said Israel was facing “a serious escalation” in the south. Speaking before a meeting with visiting EU foreign policy chief Catherine Ashton, he said the situation was “unacceptable” and that Israel would “not suffer” the ongoing rocket fire for much longer. I wonder if France would be as accommodating if it were their cities being bombed, their people being killed. Oops, I forgot, they were when Germans were doing it. I also wonder how long will Israel go until they send in ground troops to finish the job they started in Operation Cast Lead. An operation they stopped to be nice to Barack Hussein Obama and not have riots at his inauguration. Bad move. Pray for the people of Israel under constant barrage from Gaza. And if you can, throw a few dollars, Euros, etc… to the people of the Sderot Media Center. Serving the people of Sderot and Southern Israel for over a decade. Just click here. One should not start a war, but if attacked, one should defend his nation and completely annihilate the enemy and leave him sitting in a pile of rubble and then go home leaving him to try and figure out how to repair the damage. Maybe that would deter others from attacking. Of course the PLO aren’t sane. One must make it cost the enemy more than they are willing to pay. Why is it that every time the terrorists fire off a bunch of missiles that they then ask for (through a 3rd party) and get a cease fire? It just gives them more time to reload and get ready for the next time. We know why, don’t we? The people of Israel do not belong to the politically correct religion, Islam.